Originally the food of emperors, the cuisine known as kaiseki is the pinnacle of Japanese eatingand few restaurants serve a more refined menu than Kikunoi, in the former imperial capital of Kyoto. The experience begins before a single plate is served, with the setting: a tatami-mat room, bare save for the tokonoma, the alcove in the corner that displays a single scroll of calligraphy and a seasonally appropriate flower, today a lily. Then the food begins to flow, course after course of carefully trimmed portions, delivered by a kimono-clad server: a single piece of sea-bream sushi wrapped in bamboo leaf, a tiny grilled ayu fish with water-pepper vinegar, fried prawns and bamboo shoots with an egg-yolk-and-cream sauce. Kaiseki dining is the product of centuries of cultural evolution, but though Kikunoi is high-endas the bill will indicateits cuisine is meant to be a grand elaboration of the basic Japanese home meal: rice, fish, pickles, vegetables and miso soup, artfully presented in small, healthy portions. "I believe that Japanese cuisine is something embedded in Japanese people's DNA," says Kikunoi's owner, Yoshihiro Murata. That may be true, but it's a legacy under assault, increasingly crowded out by fast, convenient, Westernized food. These days, Murata says sadly, his college-age daughter doesn't see much difference between cheap restaurant food and the haute cuisine he makes. "I think that in Japan, people should eat good Japanese food," he says. "But they are far away from it." Japan is not alone. 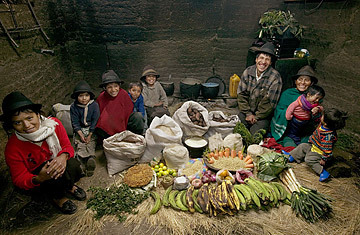 Food and diet are the cornerstones of any culture, one of the most reliable symbols of national identity. Think of the long Spanish lunch followed by the afternoon siesta, a rhythm of food and rest perfectly suited to the blistering heat of the Iberian peninsula in summer. Think of the Chinese meal of rice, vegetables and (only recently) meat, usually served in big collective dishes, the better for extended clans to dine together. National diets come to incorporate all aspects of who we are: our religious taboos, class structure, geography, economy, even government. When we eat together, "we are ordering the world around us and defining the community most important to us," says Martin Jones, a bioarchaeologist at Cambridge University and author of the new book Feast: Why Humans Share Food. Even the traditions we learn from others we adopt and adapt in ways that make them our own. Japan received chopsticks from China and tempura from Portugal. Tomatoes, that staple of pasta and pizza, arrived in Southern Europe only as part of the Columbian Exchange (so-called because of Christopher Columbus' journeys to the New World, where tomatoes originated). "A lot of what we think of as deeply rooted cultural traditions are really traceable back to global exchange," says Miriam Chaiken, a nutritional anthropologist at Indiana University of Pennsylvania. In an era of instant communication and accelerated trade, those cultural exchanges have exploded, leading to something closer to cultural homogenization. That's bad for not only the preservation of national identities but the preservation of health too. Saturated fats and meats are displacing grains and fresh vegetables. Mealtimes are shrinking. McDonald's is everywhere. From Chile to China, the risk of obesity, diabetes and heart disease is on the rise as the idiosyncratic fare that used to make mealtime in New Delhi, Buenos Aires and Sydney such distinctive experiences is vanishing. This, in turn, is leading to a minimovement in some countries to hold fast to traditional food culture, even as their menu grows ever more international. Says Jones: "With every change there's nostalgia for what's gone before."